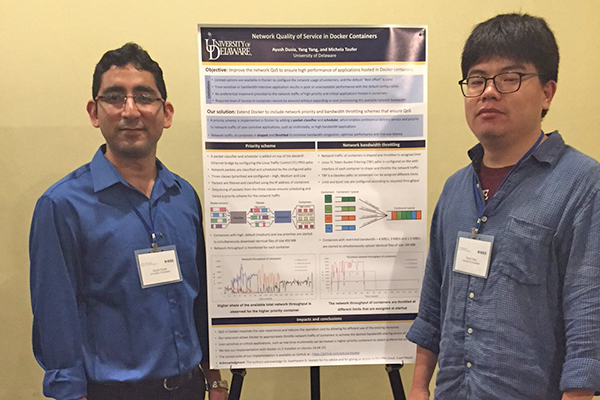 Ayush Dusia and Yang Yang presented their work on containerized cloud environments at the IEEE Cluster 2015 conference. 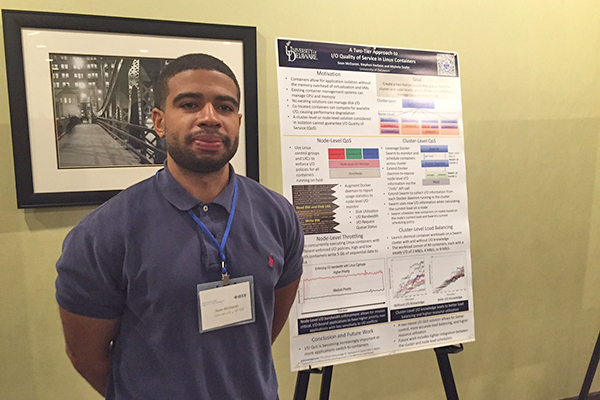 Sean McDaniel and Stephen Herbein (not pictured) presented their work on containerized cloud environments at the IEEE Cluster 2015 conference. Michela Taufer (third from left) collaborated with IBM's Seelam Setharami (second from right) to provide the students in her operating systems class with industry-relevant operating systems projects. 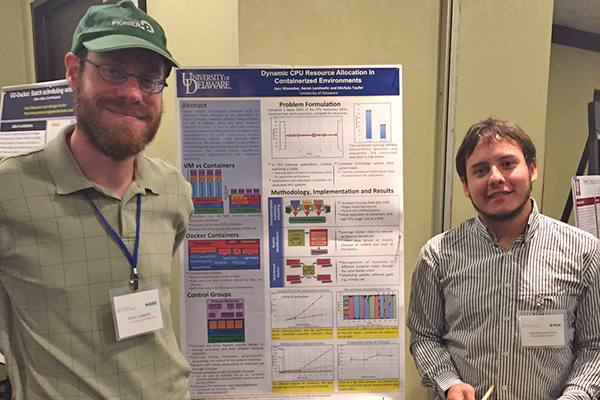 Aaron Landwehr and Jose Monsalve presented their work on containerized cloud environments at the IEEE Cluster 2015 conference. 10:05 a.m., Oct. 8, 2015--There’s a container revolution underway, but it doesn’t have anything to do with organizing your closet. In the context of computing, “containers” have been proposed as an efficient alternative to virtual machines for running applications in the cloud. However, the technology is not yet well developed, and there are quality-of-service issues with containers. Michela Taufer wanted students in her Operating Systems (OS) class at the University of Delaware to explore some of these issues, but she knew that the topic was too new to be found in textbooks. So she invited colleague Seelam Setharami from the IBM Thomas J. Watson Research Center to work with her on defining industry-relevant OS projects for her class. “IBM provided us with free access to their cloud infrastructure, and Seelam visited us to introduce the IBM infrastructure, define the projects, and assess the results,” says Taufer, the David and Beverly J.C. Mills Career Development Chair of Computer and Information Sciences. Three of the four class projects resulted in posters and short papers being submitted to IEEE Cluster 2015, which took place in Chicago in September. The students received funding from the National Science Foundation for their trip to the conference, and their work will appear in the proceedings. The work with IBM has also been compiled in a paper submitted to the IEEE International Conference on Cloud Engineering 2016, with the students, Taufer, and Setharami as co-authors. Based on the success of last semester’s collaboration, Taufer is working with IBM this semester in another course, Big Data Analytics and HPC.